Major advances have been made in understanding the mechanisms of some of the subtypes. The histological appearance of the AIDP subtype resembles experimental autoimmune neuritis, which is predominantly caused by T cells directed against peptides from the myelin proteins P0, P2, and PMP22. The role of T-cell-mediated immunity in AIDP remains unclear and there is evidence for the involvement of antibodies and complement. Strong evidence now exists that axonal subtypes of Guillain-Barré syndrome, acute motor axonal neuropathy (AMAN), and acute motor and sensory axonal neuropathy (AMSAN), are caused by antibodies to gangliosides on the axolemma that target macrophages to invade the axon at the node of Ranvier. About a quarter of patients with Guillain-Barré syndrome have had a recent C. jejuni infection, and axonal forms of the disease are especially common in these people. The lipo-oligosaccharide from the C. jejuni bacterial wall contains ganglioside-like structures and its injection into rabbits induces a neuropathy that resembles acute motor axonal neuropathy. ,, Antibodies to GM1, GM1b, GD1a, and GalNac-GD1a are in particular implicated in acute motor axonal neuropathy and, with the exception of GalNacGD1a, in acute motor and sensory axonal neuropathy. Progressive weakness in both upper and lower extremities within 4 weeks along with areflexia is essential requirement for the diagnosis. Supportive ancillary testing for GBS includes CSF analysis and electrodiagnostic testing, both of which may be normal in the early phase of GBS. The limitations of ancillary testing in the early phase combined with the importance of prompt treatment of GBS mandates that the clinician at times make the diagnosis based solely on history and examination. An elevated CSF protein concentration (with normal cell count) is only found on initial CSF analysis in 50% of patients; elevated CSF protein concentration occurs in more than 90% of patients at the peak of the disease. 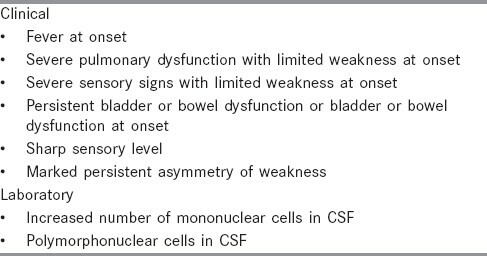 CSF pleocytosis is an important red flag, which raises the question of infectious (HIV, CMV, Lyme, sarcoid), carcinomatous, or lymphomatous polyradiculoneuropathy [Table 2]. The diagnostic yield of various neurophysiological criteria may vary in different subforms of Guillain-Barré syndrome, whose prevalence varies in different geographical areas. In a recent study the diagnostic sensitivity of Albers et al,  Cornblath,  Ho et al,  Dutch GBS Study Group,  Italian GBS Study Group,  and Albers and Kelly criteria  were evaluated and correlated with clinical subtypes of GBS, duration, severity, and outcome. The sensitivity of nerve conduction study in the diagnosis of GBS and in different clinical subtypes of GBS was highest using Albers criteria (88.2%) and lowest using Cornblath criteria (39.2%). As per Ho et al, patients could be categorized into AIDP (86.3%), AMAN (7.8%), and AMSAN (5.9%). Electrophysiological findings necessary to diagnose GBS is in [Table 3]. Incidence of antiganglioside antibodies in GBS has varied widely in different published series. , Its much more common in AMAN variant than AIDP. The incidence was found to be 58% in a study of 60 patients of GBS by Meena et al (Unpublished data from NIMS, Hyderabad). Although antiganglioside antibodies have been implicated in the pathogenesis of GBS, assaying antiganglioside values in a patient with GBS other than MFS at the present time has no diagnostic value in routine practice. 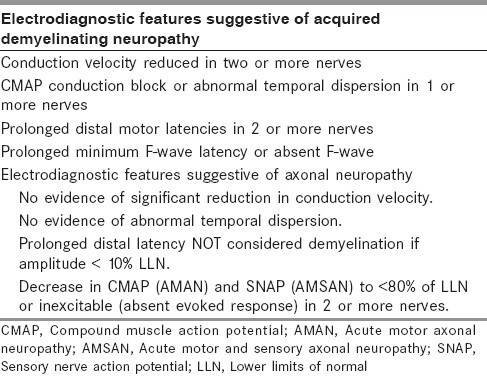 AMSAN shares many pathological features with acute motor axonal neuropathy but differs clinically from it in patient age of onset (usually adults rather than children), geographic distribution (can occur anywhere), time of onset (not only summertime), involvement of sensory nerves, course (protracted), and outcome (usually severe residual disability). ,,,, It has an abrupt onset and rapid progression with most patients requiring mechanical ventilation within a few days of symptom onset. Motor nerves are electrically inexcitable early in the disorder. Sensory nerve conduction studies are also abnormal. Widespread denervation is seen on needle examination. The course is protracted and outcome poor, with only 20% ambulating at 1 year. MFS: The more recognizable and distinct regional variant of GBS is MFS. ,, Like GBS, the onset of MFS often follows an infection, for example C. jejuni. MFS patients classically present with external ophthalmoparesis, areflexia, and ataxia,  although MFS patients often present with fewer components of the classical clinical triad ,,, or with additional clinical features (facial weakness, oropharyngeal weakness, internal ophthalmoparesis, central nervous system involvement). Bickerstaffs brainstem encephalitis (BBE) is a related syndrome in which alteration of consciousness or conticospinal tract signs are seen in addition to ophthalmoparesis and ataxia. Many patients with MFS or BBE also have "overlapping GBS" with flaccid quadriparesis. , Anti-GQ1b antibodies are present in 95% of patients with acute MFS  and in approximately two-thirds of patients with BBE. The recognition of various clinical presentations and the high sensitivity and specificity of anti-GQ1b antibody testing suggest rubric name of "anti-GQ1b antibody syndrome." Patients with GBS who are symptomatic but are able to walk unaided for more than 5 m and who are stable can be managed conservatively at peripheral centers. However, they should be observed for progression of the disease, especially if they are still within the first week of the onset of the disease. Blood pressure and heart rate fluctuations, clinical signs of respiratory failure should be carefully and meticulously monitored. Clinical signs of ileus should be watched. If any of these signs are detected they should be immediately shifted to specialized centers for further management. In the acute phase in bed-bound adult patients require both supportive therapy and immunotherapy can be used taking into consideration the cost factors and the clinical status (staging, complications, and other comorbid conditions) of individual patients. GBS is the most common peripheral neuropathy causing respiratory paralysis. Despite advances in respiratory management and immunotherapy, mortality from GBS is as high as 20% for ventilated patients. Mechanical ventilation is usually required by one third of the patients. Clinical signs like tachypnea, tachycardia, brow sweating asynchronous movements of chest and abdomen and a vital capacity < 20 mL/kg, maximal inspiratory pressures < 30 mm H 2 O, maximal expiratory pressure < 40 cm H 2 O predicts imminent respiratory failure. Time from onset to admission of less than 1 week, facial weakness, bulbar paresis, and neck weakness are other factors associated with respiratory failure. ,, Simple bedside single breath count, which correlates well with vital capacity than phrenic nerve conduction studies is a good predictor of respiratory failure (Unpublished data by Meena et al from NIMS, Hyderabad). Percutaneous dilatational tracheostomy may be advantageous over traditional tracheostomy by allowing less risk of accidental extubation and a better cosmetic outcome. In general it takes 2-6 weeks to wean out of ventilatory support. Tracheostomy may be performed 2 weeks following intubation and should be based on status of an individual. It is comfortable and provides airway safety but is associated at times with life-threatening complications and disfiguration. If pulmonary function is improving, it may be preferable to wait 1 more week to attempt at weaning from ventilator. Hyponatremia is the common electrolyte abnormality in GBS and is due to SIADH (in majority of the cases) and natriuresis. The treatment is different for both. Both require replenishment of sodium but SIADH need fluid restriction and in case of natriuresis requires intravascular volume expansion. The best way to differentiate these two conditions is by measuring central venous pressure. All patients should be given subcutaneous fractionated or unfractionated heparin and support stockings until they are able to walk independently to prevent deep vein thrombosis. If a prolonged bedridden period is anticipated and a tracheostomy has already been performed, institute oral anticoagulant treatment with warfarin coumadin. Pain and sensory symptoms are reported in majority of patients with GBS and should be treated effectively with opioid analogues. Sedation and bowel hypomotility may become a problem. Other drugs, such as gabapentin, carbamazepine acetaminophen, NSAIDs, and tricyclic antidepressants also can be tried. Nasogastric or gastric tube feeding should be instituted early and slowly. High energy (40-45 nonprotein kcal) and high protein diet (2-2.5 g/kg) have been recommended so has to reduce muscle wasting and assist respiratory weaning. Continuous enteral feeding seems to be better tolerated than bolus feeding in these patients. Surveillance for infections with weekly or more frequent sputum and urine cultures and blood count may be useful but the use of these tests should be guided by clinical circumstances. Both plasma exchange and IVIg are effective immunotherapies for adult and pediatric patients with GBS if given during the first few weeks of disease. In mild GBS, two sessions of PE are superior to none. In moderate GBS, 4 sessions are superior to 2. In severe GBS, 6 sessions are no better than 4. In line with these findings, Yuki et al reported that at least 2 PE are needed to significantly reduce the circulating immunoglobulin complexes. In developing countries where cost is the limiting factor, small volume PE may be used. In India small volume PE was used by Tharakan et al with comparable results. They used 15 mL/kg body weight/day to be continued till the progression of the disease got arrested or recovery started. This protocol is still performed in various centers in developing countries with good results. Continuous flow PE is superior to intermittent flow exchanges. The replacement fluids do not affect the outcome of PE according to the French Study Group. Although albumin was found to be superior to fresh frozen plasma as the exchange fluid. When to use PE? A better outcome was demonstrated with PE in French Study Group when compared with North American Study Group. This is due to the fact that treatment was initiated within 2 weeks in the former study group and within 4 weeks in the latter. Hence PE is more beneficial when started within 7 days after disease onset rather than later, but was still beneficial in patients treated up to 30 days after disease onset. Who should be offered PE? All patients with mild, moderate, and severe GBS benefit from treatment. Patients who need even minimum assistance for walking, who are steadily progressing and those who are bed- and ventilator-bound should be advised PE. The value of PE in children younger than 12 years is not known. Slightly more complications were observed in PE group than the IVIg group. Significant adverse events of PE include hypotension, septicemia, pneumonia, abnormal clotting, and hypocalcemia. Major hemostatic disorders, unstable cardiovascular state, active infection, and pregnancy are contraindications to PE. In general in patients with renal dysfunction the rate of infusion should be decreased to half of the normal infusion rate. Most RCTs have included only patients who are treated within the first 2 weeks from onset of weakness and who are unable to walk without assistance. If these criteria are met, there is no doubt that patients with GBS should be treated with IVIg or PE. The question remains as to what to do in patients with rapidly progressive limb weakness or impaired pulmonary function but who are still able to walk. Although not proven effective, it seems logical to treat these patients with IVIg. These patients are able to walk with some support or no support. A retrospective study showed that these patients often have residual disabilities. RCTs that have assessed the effect of IVIg have not studied the effect in mildly affected patients. It should be kept in mind that no RCTs have assessed the effect of PE or IVIg in these mildly affected patients with GBS. No RCTs have studied the effect of PE or IVIg in patients with MFS. Observational studies have suggested that the final outcome in patients with MFS is generally good. In a large uncontrolled observational study,  IVIg slightly hastened the amelioration of ophthalmoplegia and ataxia. The investigators concluded that IVIg and PE did not influence the outcome of patients with MFS, presumably because of good natural recovery. Patients with mild or uncomplicated MFS may perhaps be treated conservatively. Patients with more severe or complicated anti-GQIB antibody syndrome, an overlapping GBS, should probably receive immunotherapy. Some patients with GBS continue to deteriorate after PE or a standard course of IVIg. In these cases, the best option is unknown. Whether these patients need PE after they have been treated with IVIg has not been investigated, but the combination of PE followed by IVIg is no better than PE or IVIg alone. PE after IVIg is also not advised, because PE would probably wash out the IVIg previously administered. A study in a small series of patients investigated the effect of a second course of IVIg in severe unresponsive patients with GBS. This uncontrolled study suggested that a repeated course of IVIg could be effective. About 5%-10% of patients with GBS deteriorate after initial improvement or stabilization following IVIg treatment. Although no RCTs have assessed the effect of a repeated IVIg dose in this condition, it is common practice to give a second IVIg course (2 g/kg in 2-5 days). These patients are thought to have a prolonged immune response that causes persistent nerve damage that needs treatment for a longer period of time. A longer interval between onset and treatment and longer time to nadir may be associated with a greater chance of relapse. When faced with restrictions in financial resources, especially in developing countries cost-effectiveness of any treatment becomes a major issue in treatment decision making. This is very true in GBS in which the currently approved treatment has shown equal efficacy. There are a few available cost analysis studies addressing this issue and the results are controversial. , However, in developing countries use of small volume PE may bring down the cost when compared to IVIg. Hence the decision to use PE or IVIg must be based on multiple factors. The main limitations for use of PE would be availability of the technical expertise and support. Lack of these, ease of administration, and fewer side effects with IVIg may dictate use of IVIg as the first line of therapy. GBS is a monophasic immune-mediated neuropathy characterized by acute onset of predominantly motor weakness and is a common cause of respiratory paralysis. There are many variants described with different prognosis and manifestations. Electrodiagnosis aids in the diagnosis. Immunotherapy definitely makes a difference in the recovery of GBS patients and both PE and IVIg are equally effective. IVIg may be preferred because of its low side-effect profile and ease of administration. However, small volume PE can be used with equal efficacy due to cost constraints. Attentive anticipatory supportive treatment is equally important in reducing the morbidity and mortality in GBS. 1. Levin KH. Variants and mimics of Guillain-Barré syndrome. Neurologist 2004;10:61-74. 2. Chiò A, Cocito D, Leone M, Giordana MT, Mora G, Mutani R. Guillain-Barré syndrome: A prospective, population based incidence and outcome survey. Neurology 2003;60:1146-50. 3. Hughes RA, Rees JH. Clinical and epidemiologic features of Guillain-Barré syndrome. J Infect Dis 1997;176:S92-8. 4. Alter M. The epidemiology of Guillain-Barré syndrome. Ann Neurol 1990;27:S7-12. 5. Willison HJ. The immunobiology of Guillain-Barré syndromes. J Peripher Nerv Syst 2005;10:94-112. 6. McKhann GM, Cornblath DR, Griffin JW, Ho TW, Li CY, Jiang Z, et al. Acute motor axonal neuropathy: A frequent cause of acute flaccid paralysis in China. Ann Neurol 1993;33:333-42. 7. Ogawara K, Kuwabara S, Mori M, Hattori T, Koga M, Yuki N. Axonal Guillain-Barré syndrome: Relation to antiganglioside antibodies and Campylobacter jejuni infection in Japan. Ann Neurol 2000;48:624-31. 8. Sinha S, Prasad KN, Jain D, Pandey CM, Jha S, Pradhan S. Preceding infections and gangliosides antibodies in patients with Guillain-Barré syndrome: A single center prospective case-control study. Clin Microbial Infect 2007;13:334-7. 9. Gupta D, Nair M, Baheti NN, Sarma PS, Kuruvilla A. Electrodiagnostic and clinical aspects of Guillain-Barré syndrome: An analysis of 142 cases. J Clin Neuromuscul Dis 2008;10:42-51. 10. Kaur U, Chopra JS, Prabhakar S, Radhakrishnan K, Rana S. Guillain-Barré syndrome - a clinical electrophysiological and biochemical study. Acta Neurol Scand 1986;73:394-402. 11. Alter M . The epidemiology of Guillain-Barré syndrome. Ann Neurol 1990;27:7-12. 12. Gupta SK, Taly AB, Suresh TG, Rao S, Nagaraja D. Acute idiopathic axonal neuropathy (AIAN) - a clinical and electrophysiology observation. Acta Neurol Scand 1994;89:220-4. 13. Jacobs BC, Rothbarth PH, van der Meché FG, Herbrink P, Schmitz PI, de Klerk MA, et al. The spectrum of antecedent infections in Guillain-Barré syndrome: A case control study. Neurology 1998;51:1110-5. 14. Ravi V, Taly AB, Shankar SK, Shenoy PK, Desai A, Nagaraja D, et al. Association of Japanese encephalitis virus infection with Guillain-Barré syndrome in endemic areas of south-India. Acta Neurol Scand 1994;90:67-72. 15. Green DM, Ropper AH, Mild Guillain-Barré syndrome. Arch Neurol 2001;58:1098-101. 16. Winer JB, Hughes RA, Osmond C. A prospective study of acute idiopathic neuropathy. I. clinical features and their prognostic value. J Neurol Neurosurg Psychiatry 1988;51:605-12. 17. Moulin DE, Hagen N, Feasby TE, Amireh R, Hahn A. Pain in Guillain-Barré syndrome. Neurology 1997;48:328-31. 18. Ropper AH. The Guillain-Barré syndrome. N Engl J Med 1992;326:1130-6. 19. Lawn ND, Fletcher DD, Henderson RD, Wolter TD, Wijdicks EF. Anticipating mechanical ventilation in Guillain-Barré Syndrome. Arch Neurol 2001;58:893-8. 20. Taly AB, Arunodaya GR, Rao S. Sympathetic skin response in Guillain-Barré syndrome. Clin Auton Res 1995;5:215-20. 21. Willison HJ. Ganglioside complexes as targets for antibodies in Miller Fisher syndrome. J Neurol Neurosurg Psychiatry 2006;77:1002-3. 22. Sheikh KA, Nachamkin I, Ho TW, Willison HJ, Veitch J, Ung H, et al. Campylobacter jejuni lipopolysaccharides in Guillain-Barré syndrome: Molecular mimicry and host susceptibility. Neurology 1998;51:371-8. 23. Vriesendorp FJ, Mishu B, Blaser MJ, Koski CL. Serum antibodies to GM1, GD1b, peripheral nerve myelin, and Campylobacter jejuni in patients with Guillain-Barré syndrome and controls: Correlation and prognosis. Ann Neurol 1993;34:130-5. 24. Albers JW, Kelly JJ Jr. Acquired inflammatory demyelinating polyneuropathies: Clinical and electrodiagnostic features. Muscle Nerve 1989;12:435-51. 25. Albers JW, Donofrio PD, McGonagle TK. Sequential electrodiagnostic abnormalities in acute inflammatory demyelinating polyradiculoneuropathy. Muscle Nerve 1985;8:528- 39. 26. Ropper AH, Wijdicks EF, Shahani BT. Electrodiagnostic abnormalities in 113 consecutive patients with Guillain-Barré syndrome. Arch Neurol 1990;47:881-7. 27. Gordon PH, Wilbourn AJ. Early electrodiagnostic findings in Guillain-Barré syndrome. Arch Neurol 2001;58:913-7. 28. Durand MC, Lofaso F, Lefaucheur JP, Chevret S, Gajdos P, Raphaël JC, et al. Electrophysiology to predict mechanical ventilation in Guillain-Barré syndrome. Eur J Neurol 2003;10:39- 44. 29. Cornblath DR, Mellits ED, Griffin JW, McKhann GM, Albers JW, Miller RG, et al. Motor conduction studies in Guillain-Barré syndrome: Description and prognostic value. Ann Neurol 1988;23:354-9 . 30. Albers JW, Donofrio PD, McGonagle TK. Sequential electrodiagnostic abnormalities in acute inflammatory demyelinating polyradiculoneuropathy. Muscle Nerve 1985;8:528- 39. 31. Cornblath DR. Electrophysiology in Guillain-Barré syndrome. Ann Neurol 1990;27:S17-20. 32. Ho TW, Mishu B, Li CY, Gao CY, Cornblath DR, Griffin JW, et al. Guillain-Barré syndrome in Northern China. Relationship to Campylobacter jejuni infection and antiglycolipid antibodies. Brain 1995;118:597-605. 33. Meulstee J, van der Meché FG. Electrodiagnostic criteria for polyneuropathy and demyelination: Application in 135 patients with Guillain-Barré syndrome. Dutch Guillain Barré Study Group. J Neurol Neurosurg Psychiatry 1995;59:482-6. 34. Italian Guillain Barré Study Group. The prognosis and main prognostic indicators of Guillain-Barré syndrome. Brain 1996;119:2053-61. 35. Albers JW, Kelly JJ. Acquired inflammatory demyelinating polyneuropathies: Clinical and electrodiagnostic features. Muscle Nerve 1989;12:435-51. 36. Kalita J, Misra UK, Das M. Neurophysiological criteria in the diagnosis of different clinical types of Guillain-Barré syndrome. J Neurol Neurosurg Psychiatry 2008;79:289-93. 37. Ylyas AA, Willison HJ, Quarles RH, Jugalwala FB, Cornblath DR, Trapp BD, et al. Serum antibodies to gangoliosides in GB Syndrome. Ann Neurol 1988;23:440-7. 38. Menon A, Patil AS, Taly AB, Vasanth A. Anti-Ganglioside antibodies in GB syndrome: Do they indicate prognosis. Ann Indian Acad Neurol 2003;6;11-6. 39. Hughes R, Sanders E, Hall S, Atkinson P, Colchester A, Payan P. Subacute idiopathic demyelinating polyradiculoneuropathy. Arch Neurol 1992;49:612-6. 40. Oh SJ, Kurokawa K, de Almeida DF, Ryan HF Jr, Claussen GC. Subacute inflammatory demyelinating polyneuropathy. Neurology 2003;61:1507-12. 41. Feasby TE, Gilbert JJ, Brown WF, Bolton CF, Hahn AF, Koopman WF, et al. An acute axonal form of Guillain-Barré polyneuropathy. Brain 1986;109:1115-26. 42. Feasby TE, Hahn AF, Brown WF, Bolton CF, Gilbert JJ, Koopman WJ. Severe axonal degeneration in acute Guillain-Barré syndrome: Evidence of two different mechanisms? J Neurol Sci 1993;116:185-92. 43. Griffin JW, Li CY, Ho TW, Tian M, Gao CY, Xue P, et al. Pathology of the motor-sensory axonal Guillain-Barré syndrome. Ann Neurol 1996;39:17-28. 44. Griffin JW, Li CY, Macko C, Ho TW, Hsieh ST, Xue P, et al. Early nodal changes in the acute motor axonal neuropathy pattern of the Guillain-Barré syndrome. J Neurocytol 1996;25:33-51. 45. Fisher M. An unusual variant of acute idiopathic polyneuritis (syndrome of opthalmoplegia, ataxia and areflexia). N Engl J Med 1956;255:57-65. 46. Overell JR, Willison HJ. Recent developments in Miller Fisher syndrome and related disorders. Curr Opin Neurol 2005;18:562-6. 47. Yuki N, Taki T, Takahashi M, Saito K, Yoshino H, Tai T, et al. Molecular mimicry between GQ1b ganglioside and lipopolysaccharides of Campylobacter jejuni isolated from patients with Fisher's syndrome. Ann Neurol 1994;36:791-3. 48. Ogawara K, Kuwabara S, Yuki N. Fisher syndrome or Bickerstaff brainstem encephalitis? Anti-GQ1b IgG anti-body syndrome involving both the peripheral and central nervous systems. Muscle Nerve 2002;26:845-9. 49. Radziwill AJ, Steck AJ, Borruat FX, Bogousslavsky J. Isolated internal opthalmoplegia associated with IgG anti-GQ1b antibody. Neurology 1998;50:307. 50. Odaka M, Yuki N, Yamada M, Koga M, Takemi T, Hirata K, et al. Bickerstaff's brainstem encephalitis: Clinical features of 62 cases and a subgroup associated with Guillain-Barré syndrome. Brain 2003;126:2279-90. 51. Chiba A, Kusunoki S, Obata H, Machinami R, Kanazawa I. Serum anti-gq1b IgG antibody is associated with ophthalmoplegia in Miller Fisher syndrome and Guillain-Barré syndrome: Clinical and immunohistochemical studies. Neurology 1993;43:1911-7. 52. Kashihara K, Shiro Y, Koga M, Yuki N. IgG anti-GT1a antibodies which do not cross react with GQ1b ganglioside in a pharyngeal-cervical-brachial variant of Guillain-Barré syndrome. J Neurol Neurosurg Psychiatry 1998;65:799. 53. Nagashima T, Koga M, Odaka M, Hirata K, Yuki N. Clinical correlates of serum anti-GT1A IgG antibodies. J Neurol Sci 2004;219:139-45. 54. Nishimoto Y, Odaka M, Hirata K, Yuki N. Usefulness of anti-GQ1b IgG antibody testing in Fisher syndrome compared with cerebrospinal fluid examination. J Neuroimmunol 2004;148:200-5. 55. Fross RD, Daube JR. Neuropathy in the Miller Fisher syndrome: Clinical and electrophysiologic findings. Neurology 1987;37:1493- 8. 56. Nagaoka U, Kato T, Kurita K, Arawaka S, Hosoya T, Yuki N, et al. Cranial nerve enhancement on three-dimensional MRI in Miller Fisher syndrome. Neurology 1996;47:1601-2. 57. Mori M, Kuwabara S, Fukutake T, Yuki N, Hattori T. Clinical features and prognosis of Miller Fisher syndrome. Neurology 2001;56:1104-6. 58. Willison HJ. Ganglioside complexes as targets for antibodies in Miller Fisher syndrome. J Neurol Neurosurg Psychiatry 2006;77:1002-3. 59. Hughes RA, Wijdicks EF, Benson E, Cornblath DR, Hahn AF, Meythaler JM, et al. Supportive care for patients with Guillain-Barré syndrome: Multidisciplinary Consensus Group. Arch Neurol 2005;62:1194-8. 60. Durand MC, Porcher R, Orlikowski D, Aboab J, Devaux C, Clair B, et al. Clinical and electrophysiological predictors of respiratory failure in Guillain-Barré syndrome: A prospective study. Lancet Neurol 2006;5:1021-8. 61. Sharshar T, Chevret S, Bourdain F, Raphael JC. French Cooperative Group on Plasma Exchange in Guillain-Barré syndrome. Early predictors of mechanical ventilation in Guillain-Barré syndrome. Crit Care Med 2003;31:278-83. 62. Lawn ND, Wijdicks EF. Post-intubation pulmonary function test in Guillain-Barré syndrome. Muscle Nerve 2000;23:613-6. 63. Lichtenfeld P. Autonomic dysfunction in the Guillain-Barré syndrome. Am J Med 1971;50:772-80. 64. Zochodne DW. Autonomic involvement in Guillain-Barré syndrome: A review. Muscle Nerve 1994;17:1145-55. 65. Truax BT. Autonomic disturbances in the Guillain-Barré syndrome. Semin Neurol 1984;4:462-8. 66. Tuck RR, McLeod JG. Autonomic dysfunction in Guillain-Barré syndrome. J Neurol Psychiatry 1981;44:983-90. 67. Flachenecker P, Hartung HP, Reiners K. Power spectrum analysis of heart rate variability in Guillain-Barré syndrome. A longitudinal study. Brain 1997;120:1885-94. 68. Flachenecker P, Wermuth P, Hartung HP, Reiners K. Quantitative assessment of cardiovascular autonomic function in Guillain-Barré syndrome. Ann Neurol 1997:42:171-9. 69. Burns TM, Lawn ND, Low PA, Camilleri M, Wijdicks EF. Adynamic Ileus in severe Guillain-Barré syndrome. Muscle Nerve 2001;24:963-5. 70. Emmons PR, Blume WT, DuShane JW. Cardiac monitoring and demand pacemaker in Guillain-Barré syndrome. Arch Neurol 1975;32:59-61. 71. Favre H, Foex P, Guggisberg M. Use of demand pacemaker in a case of Guillain-Barré syndrome. Lancet 1970;1:1062-3. 72. Hughes RA, Wijdicks EF, Barohn R, Benson E, Cornblath DR, Hahn AF, et al. Practice parameter: Immunotherapy for Guillain-Barré syndrome: Report of the Quality Standards Subcommittee of the American Academy of Neurology. 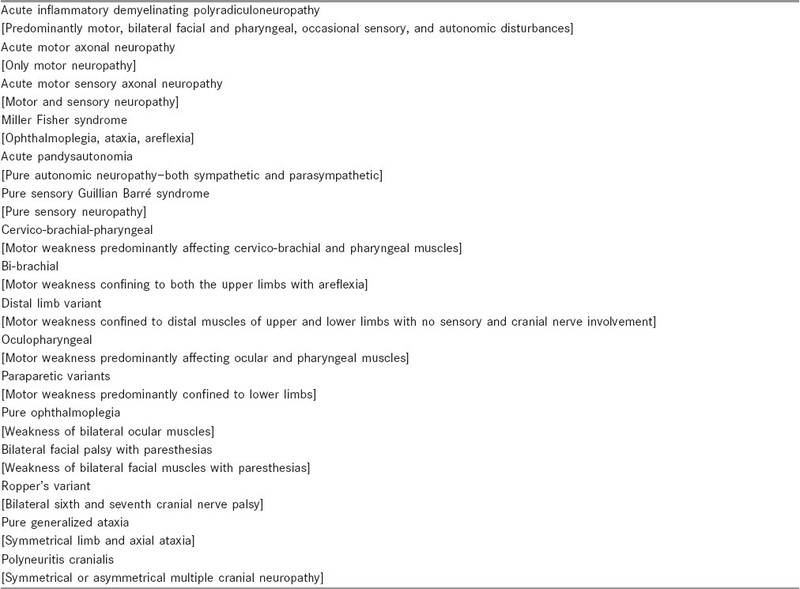 Neurology 2003;61:736-40. 73. Raphaël JC, Chevret S, Hughes RA, Annane D. Plasma exchange for Guillain-Barré syndrome. Cochrane Database Syst Rev. 2001;2:CD001798. 74. Espérou H, Jars-Guincestre MC, Bolgert F, Raphaël JC, Durand-Zaleski I. Cost analysis of plasma-exchange therapy for the treatment of Guillain-Barré syndrome. French Cooperative Group on Plasma Exchange in Guillain-Barré Syndrome. Intensive Care Med 2000;26:1094-100. 75. Plasmapheresis and acute Guillain-Barré syndrome. The Guillain-Barré Syndrome Study Group. Neurology 1985;35:1096-104. 76. French Cooperative Group on Plasma Exchange in Guillain-Barré syndrome. Appropriate number of plasma exchanges in Guillain-Barré syndrome. Ann Neurol 1997;41:298-306. 77. Yuki N, Tagawa Y, Hirata K. Minimal number of plasma exchanges needed to reduce immunoglobulin in Guillain-Barré syndrome. Neurology 1998;51:875-7. 78. Tharakan J, Jayaprakash PA, Iyer VP. Small volume plasma exchange in Guillain-Barré syndrome: Experience in 25 patients. J Assoc Physicians India 1990;38:550-3. 79. Efficacy of plasma exchange in Guillain-Barré syndrome: Role of replacement fluids. French Cooperative Group on Plasma Exchange in Guillain-Barré syndrome. Ann Neurol 1987;22:753- 61. 80. Okamiya S, Ogino M, Ogino Y, Irie S, Kanazawa N, Saito T, et al. Tryptophanimmobilized column-based immunoadsorption as the choice method for plasmapheresis in Guillain-Barré syndrome. Ther Apher Dial 2004;8:248-53. 81. Haupt WF, Rosenow F, van der Ven C, Borberg H, Pawlik G. Sequential treatment of Guillain-Barré syndrome with extracorporeal elimination and intravenous immunoglobulin. J Neurol Sci 1996;137:145-9. 82. Hughes RA, Swan AV, van Koningsveld R, van Doorn PA. Corticosteroids for Guillain-Barré syndrome. Cochrane Database Syst Rev 2006;2:CD001446. 83. van der Meché FG, Schmitz PI. A randomized trial comparing intravenous immune globulin and plasma exchange in Guillain-Barré syndrome. Dutch Guillain-Barré Study Group. N Engl J Med 1992;326:1123-9. 84. Hughes RA, Raphael JC, Swan AV, van Doorn PA. Intravenous immunoglobulin for Guillain-Barré syndrome. Cochrane Database Syst Rev 2006;1:CD002063. 85. Susuki K, Yuki N. Effect of methylprednisolone in patients with Guillain-Barré syndrome. Lancet 2004;363:1236-7. 86. van Koningsveld R, Schmitz PI, van der Meche FG, Visser LH, Meulstee J, van Doorn PA. Effect of methylprednisolone when added to standard treatment with intravenous immunoglobulin for Guillain-Barré syndrome: Randomised trial. Lancet 2004;363:192- 6. 87. Van Koningsveld R, Schmitz PI, Ang CW, Groen J, Osterhaus AD, Van der Meché FG, et al. Infections and course of disease in mild forms of Guillain-Barré syndrome. Neurology 2002;58:610-4. 88. Overell JR, Hsieh ST, Odaka M, Yuki N, Willison HJ. Treatment for Fisher syndrome, Bickerstaff 's brainstem encephalitis and related disorders. Cochrane Database Syst Rev 2007;1:CD004761. 89. Mori M, Kuwabara S, Fukutake T, Hattori T. Intravenous immunoglobulin therapy for Miller Fisher syndrome. Neurology 2007;68:1144-6. 90. Farcas P, Avnun L, Frisher S, Herishanu YO, Wirguin I. Efficacy of repeated intravenous immunoglobulin in severe unresponsive Guillain-Barré syndrome. Lancet 1997;350:1747. 91. van Koningsveld R, Steyerberg EW, Hughes RA, Swan AV, van Doorn PA, Jacobs BC. A clinical prognostic scoring system for Guillain-Barré syndrome. Lancet Neurol 2007;6:589-94. 92. Visser LH, van der Meché FG, Meulstee J, van Doorn PA. Risk factors for treatment related clinical fluctuations in Guillain-Barré syndrome. Dutch Guillain-Barré Study Group. J Neurol Neurosurg Psychiatry 1998;64:242-4. 93. Nagpal S, Benstead T, Shumak K, Rock G, Brown M, Anderson DR. Treatment of Guillain-Barré syndrome: A cost -effectiveness analysis. J Clin Apher 1999;14:107-13. 94. Tsai CP, Wang KC, Liu CY, Sheng WY, Lee TC. Pharmacoeconomics of therapy for Guillain-Barré syndrome: Plasma exchange and intravenous immunoglobulin. J Clin Neurosci 2007;14:625-9. 95. Bradshaw DY, Jones HR Jr. Guillain-Barré syndrome in children: Clinical course, electrodiagnosis, and prognosis. Muscle Nerve 1992;15:500-6. 96. Garssen MP, Schmitz PI, Merkies IS, Jacobs BC, van der Meché FG, van Doorn PA. Amantadine for treatment of fatigue in Guillain-Barré syndrome: A randomised, double blind, placebo controlled, crossover trial. J Neurol Neurosurg Psychiatry 2006;77:61-5. 97. Garssen MP, Bussmann JB, Schmitz PI, Zandbergen A, Welter TG, Merkies IS, et al. Physical training and fatigue, fitness, and quality of life in Guillain-Barré syndrome and CIDP. Neurology 2004;63:2393-5.